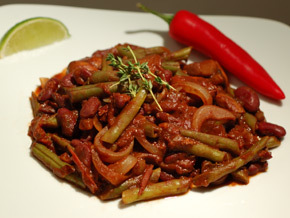 This vegetarian chili recipe has been spiced up in a Mexican style by adding cocoa power to the mix. Although many people find this a surprising combination, it adds a unique richness to the sauce. Chop the chili into small pieces and mix together with the tomatoes, tomato puree, balsamic vinegar, herbs, cocoa powder and crushed garlic. 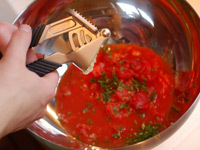 Use a hand mixer or a blender to make a thick sauce. 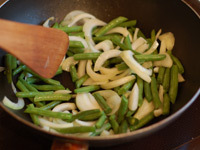 Chop the green beans in half and lightly fry them in olive oil together with the sliced onion. Add the mushrooms, kidney beans and sweet corn and fry for a few minutes longer. I used chestnut mushrooms cut into quarters as my local store were all out of button mushrooms. 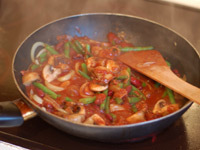 Add the sauce to the pan, cover with a lid and leave to simmer for 10-15 minutes on a low heat.